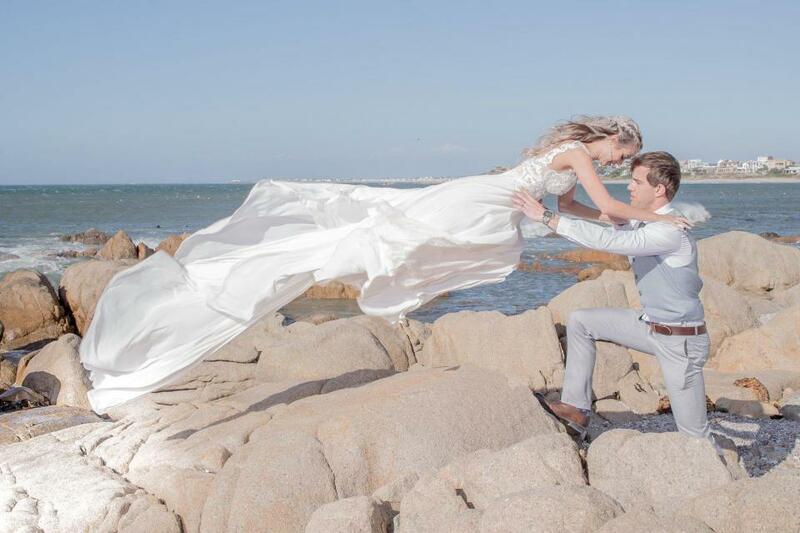 "Mark and Chantel tied the knot on a gorgeous February afternoon at Sea Trader, West Coast, South Africa. They came all the way from Edinburgh, Scotland where they now reside to celebrate their union with friends and family. The groom wore his traditional Scottish kilt, as part of the Black watch clan (his grandfathers regiment), with batman cufflinks which the bride gave him as a wedding gift. The groomsmen each wore their own family kilt attire. Chantel who is originally from South Africa, looked breathtaking in her wedding gown and very unique Vivienne Westwood shoes and a stunning heart bracelet that was Mark’s wedding gift to her. The wedding was a relaxed atmosphere with the sea forming the backdrop for their wedding ceremony. Mark and Chantel got engaged a year and 4 months after they met and tied the knot almost two years later. Congratulations again Mr and Mrs Archibald."